"We all stand on each other's shoulders", I once replied when a solution-focused colleague complimented me with something I'd written. This was my admittedly strange way of expressing something like that we all build on each other's work and (hopefully) collectively progress our thinking. I was of course making a variation on the metaphor of the dwarf standing on the shoulder of a giant which Isaac Newton used (but not invented; it is attributed to Bernard of Chartres, who lived in the twelfth century). 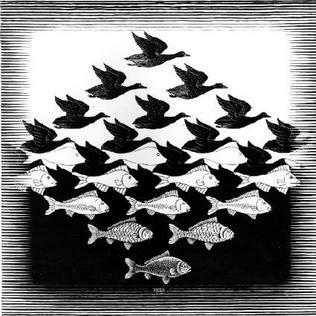 When I had made that strange expression my colleague appreciatively replied: "It shows you're from the country of Escher. M.C. 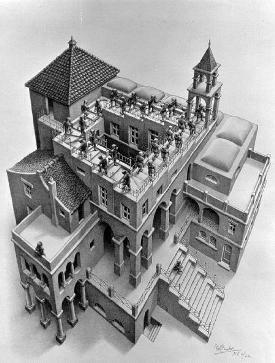 Escher was, of course, the famous Dutch graphic artist known for his lithographs and woodcuts of impossible realities. Well-known examples are Drawing hands, Sky and Water, and Ascending and Descending. Yesterday, when I posted my 'we all stand on each other's shoulders remark I got two interesting comments. One was from my solution-focused friend Paolo Terni who said: "And I hope somebody is standing on solid ground, somewhere! :)", which is a nice example of his wits. The other was from another solution-focused friend, Kirsten Dierolf, who replied to Paolo: "Nope. It's turtles all the way down...". She refers to a the opening anecdote in Stephen Hawking's book A Brief History of Time: A well-known scientist (some say it was Bertrand Russell) once gave a public lecture on astronomy. He described how the earth orbits around the sun and how the sun, in turn, orbits around the center of a vast collection of stars called our galaxy. At the end of the lecture, a little old lady at the back of the room got up and said: "What you have told us is rubbish. The world is really a flat plate supported on the back of a giant tortoise." The scientist gave a superior smile before replying, "What is the tortoise standing on?" "You're very clever, young man, very clever," said the old lady. "But it is turtles all the way down!" The thing about hoping someone is standing on solid ground is very clever and very apt. It's a very accessible metaphor for the classic epistemological problem of coherentism vs. foundationalism. In the former view, ideas all depend on each other mutually with none being privileged in principle, like a bunch of people supporting each other but we aren't sure if any is really standing anywhere solid. The latter view attempts to build up something solid by starting from privileged first principles. Like a couple of very stout folk standing at the bottom with everyone else relying on them. I think the deeper you go into this, the more you realize that you have shift between them sometimes to reflect both the resourcefulness and systematicity aspects of real thinking. My favorite treatment of this is in Susan Haack's "Evidence and Inquiry," where she offers a hybrid solution based on a crossword puzzle analogy. Essentially there are tentative privileged axioms that we build on for thinking purposes, just like the guesses in a crossword puzzle. Then we determine by coherence with each other whether they really fit or not. In that way we use both approaches back and forth. BTW, trivia: the "turtles" story also got a lot of play among pop psychology fans in the U.S. years ago when NLP co-founder linguist John Grinder used it as the title of a book about human genius. I also think Paolo's remark is very clever and to the point. I wasn't familiar with 'Coherentism vs. Foundationalism' but I find it appealing. Sometimes we can build grandiose theories which are coherent but turn out to lack foundation. It would be interesting (and important) to explicitly apply this going back and forth between Coherentism and Foundationalism to the solution-focused approach. I'll think about what questions we could use to do that. Ideas on this are of course welcome. ... and all the more important to find the last turtle in SF :-) (or invent, or at least go down some turtles ...) When I was studying theology, I used to say that faith is in some sense sacrificium intellectu but the object of theology is to push that point to the farthest limit, the lowest turtle. For me, one of the foundations for my understanding of SF is that psychology happens in and is best explained in person grammar (following Rom Harré's argumentation in "The Singular Self" and "Cognitive Science"): and I know that's also a wiggly turtle to stand on. But it's better than not thinking about it. O. By the way. My question would be: "What are some of the lowest turtles we can identify?" Classically, I think the lowest turtles would be epistemological and ontological assumptions: how we know what we know, and what sorts of things exist. About that I just want to say that different questions lead to different ways of answering, and different answers lead to very different ways of thinking. Scientific thinking for example relies on a certain flavor of realism because we assume that different theories build on the things identified in other theories, and that these are the same underlying things. So for example we tend to rely on fundamentals across fields to be able do interdisciplinary science. Commonsense reasoning relies more on short chains of reasoning where we bolster the reasoning at each step with evidence, but we don't rely as much on going back through long chains or formal models. This is a more flexible way of thinking but less systematic. It's like mapping as you go rather than starting with a globe and drilling down and trying to fill in the missing pieces. A lot of tricky issues are matters of using different ways of thinking, and obstacles in resolving them are often the result of getting stuck (sometimes deliberately) in a particular way. That's closely related to the fact that explanations most often need to use simplified models, and different models often contain different kinds of representations, which require different kinds of thinking. That's the way I tend to visualize this. Sorry for the rambling, but it's such a huge and interesting topic. Hard to start on it without just releasing my top level of mind rabbits. The subject is huge indeed. And hard (for me, anyway). Will we ever have a good answer to what the metaphorical first turtle is? 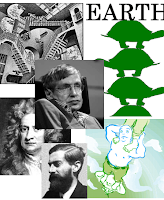 I think Hawking's point was: better to admit we don't know what started it all than to assume it was an endless line of turtles for which there is no indication. Talk about Foundationalism... At the ultimate beginning we know of no solid ground whatsoever which justifies the question: how can we know anything without knowing everything? Personally, I was heavily influenced by my efforts to understand the writings of the early American "pragmatists" like James, Peirce, and Dewey. Their common perception I think was largely based on the notion that what we are calling foundationalism had contributed significantly to widespread, even institutionalized narrow mindedness and --> that flexible thinking could save the day. I think they were right in some very basic respects (though perhaps not all) and that resourcefulness is still the key to good human thinking. The challenge is both developing resourcefulness and applying it within the right structures for actually solving real problems. 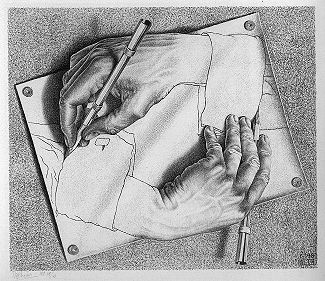 _Their_ notion of flexible thinking was based on the idea that words and perhaps thoughts are actually tools for thinking rather than tokens directly representing real things. This idea has been criticized and sometimes rightly for being taken too far. There are various entire systems that were supposed to help us think by helping us use words better as tools (e.g. Korzybski, general semantics, etc.). I think they got some things right, but were too focused perhaps on language alone. Personally I love the "words and ideas as thinking tools" idea and I think it still has a tremendous amount of purchase for practical problem solving, just as the pragmatists insisted. More so today now that cognitive neuroscience can help identify the specific mind and brain tools and the specifics of the skills we use to switch between them. This notion is something taken too far into coherentism, as in poststructuralist philosophy where meaning completely breaks down and loses it foundation in anything solid at all. I don't believe that has to be the case. I think you can see ideas as have value in thinking as tools without going so far as to deny that there are always feet on the ground somewhere. I've thought a lot about the specifics, but this is perhaps already too self-indulgently philosophical for this practically oriented forum and I'm self-conscious about it. Thanks for featuring my comment! Which also shows a distinction: staying on the surface vs. analysis. Our brief conversation was about 'staying on the surface". SOmething that as a SF practitioner I strive to do with my clients. Stay with their words, stay literal, do not add anything, do not add further layers. The comment thread is about digging deeper, it is a different language game: having an epistemological conversation. Hi Todd, thank you for that interesting explanation on pragmatism. I agree that pragmatic, flexible thinking goes a long way. And I think William James has had a great influence on the thinking that lead to the solution-focused approach.